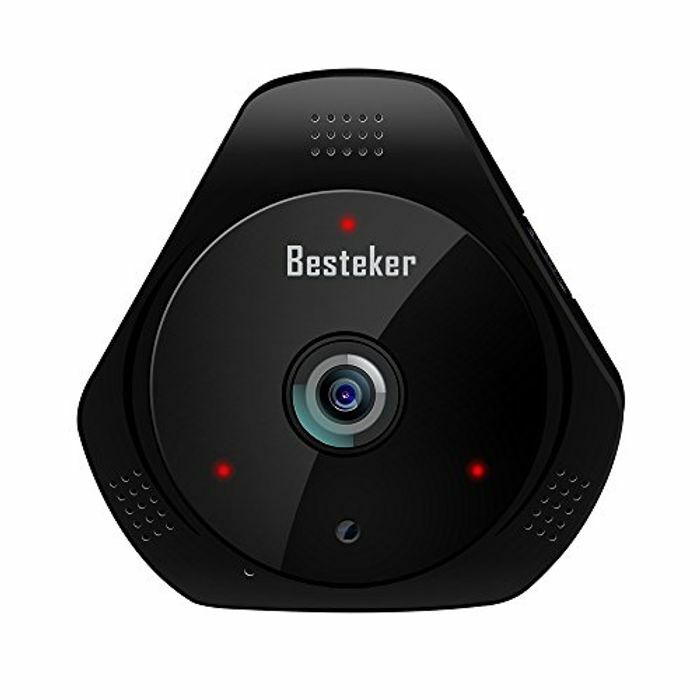 360° IP Wireless Security Camera - £10.39 from Amazon! Use code: 8X3A6Z4M or redeem promotion to get this price! 【WIDE VIEWING ANGLE & NIGHT VISION】WiFi IP camera provides 360 Degree view angle with 1/3'' Fisheye Lens, IR auto switch, clearly see the entire room with Night Vision up to 10 Meters. 【MOTION DETECT ALERT】Get informed about every movement at anytime, anywhere. The IP Camera will push a message and alerts' moving picture when it feel something is moving. Ideal for baby monitoring and home security, private and secure. 【TWO-WAY AUDIO】 With built-in mic and speaker, you can watch and listen what's happening in the house or have a real-time communication with your family. Wireless camera quick setup via iOS or Android using the MIPC APP. 【REMOTE MONITORING】 Remote access to the camera on your devices via 3G/4G/WiFi. Support Local Storage to SD card (Up to 128G, NOT included) and playback. 【3D VIEW FUNCTION 】1.3 Megapixel HD network IP camera with digital zoom can Visual range up to 360 °,and capture clear image in different angles. Big thanks for sharing... ordered successfully. Can this be sat on window sill inside house as it is wireless? Bought one to test - Only a ten pounds even if its rubbish just return it sharkalos ! I am techno lady i love my gadgets cannot resist! Me too... lovin’ The gadgets... it does become expensive tho, especially when, like me, you’ve got Prime. Wont work outside - it has vents for the speakers and microphone and will not be weatherproof unless you seal it yourself with either waterproof tape or silicone sealant! The thing i like about it that I havent seen before is it actually has voice synthesis and speaks to you when you are setting it up! Will work as a webcam quite easily and can run from usb port on your pc rather than the supplied usb power jack! Only the price is nice. Can it be used an a dash cam in car? Does it have to be connected to home/office wifi to be able to view footage on your phone? Can you connect your phone to this camera without wifi?